The first thing that grabs you is the cowbell, and if that doesn’t get your immediate attention, then you’re dead. Then comes Charlie Watts’ rim-shot snare attack that sets up one of the funkiest drum patterns this side of Memphis. Enter the hip-swaying guitar crunch of Keith Richards and Bill Wyman’s funk-infused bass playing that sets this track (and you, the listener) into motion. The rest of the band kicks into the groove…yes, on this one, it’s all about the groove. 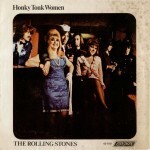 And the groove of “Honky Tonk Woman” is as infectious as it is incessant. 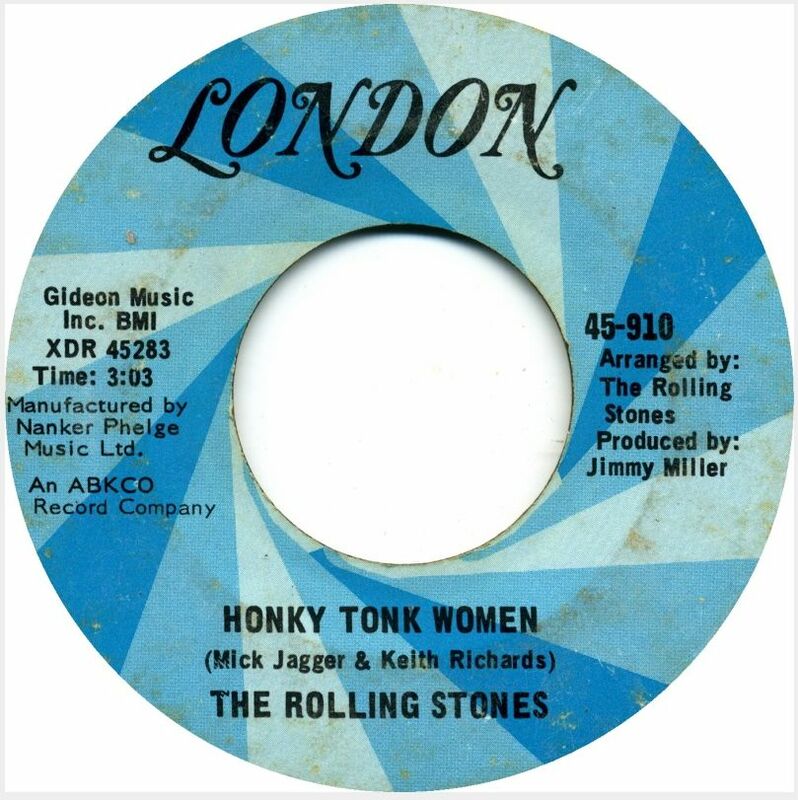 Several versions of “Honky Tonk Woman,” the top side of today’s jukebox classic, were recorded by The Stones in 1969. There was today’s single version that found its way onto the compilation album Through The Past Darkly (Big Hits Vol. 2). The original was a country version that was based on Hank Williams’ “Honky Tonk Blues” and recorded before the electric version. It was later released on their Let It Bleed album under the title “Country Honk” with a much slower tempo with different lyrics. A third version was performed in concert and captured on Get Yer Ya-Ya’s Out! with a different second verse. Doesn’t matter which version’s your pleasure, they’re all superb! 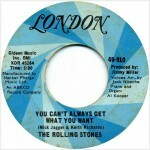 The single topped both the US and UK charts in 1969, and it’s been a staple of The Stones’ concerts ever since. 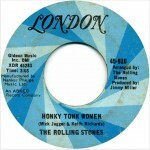 The “Country Honk” version was the group’s first attempt at the song and it is notable for being Brian Jones’ last recording with the band. According to Keith Richards, the electric take of the track was influenced by Jones’ replacement Mick Taylor. Richards: “… the song was originally written as a real Hank Williams/Jimmie Rodgers/1930s country song. And it got turned around to this other thing by Mick Taylor, who got into a completely different feel, throwing it off the wall another way.” (Crawdaddy via Wikipedia). However, since memory isn’t Mr. Richards’ strong suit, Mick Taylor says: “I added something to ‘Honky Tonk Woman’, but it was more or less complete by the time I arrived and did my overdubs.” (McPherson, Ian. 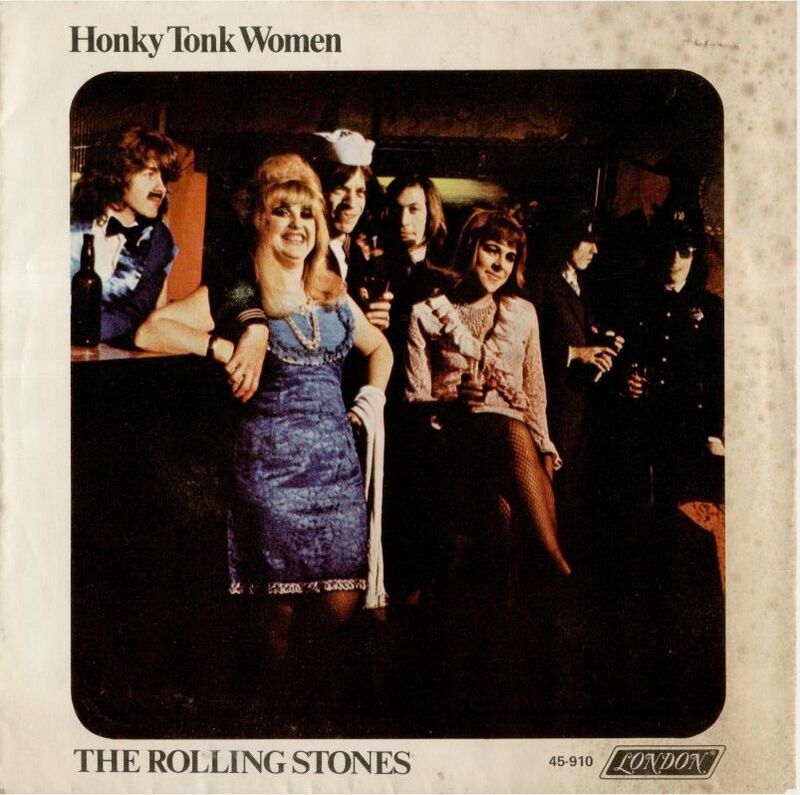 Track Talk: Honky Tonk Women via Wikipedia) Over the years, Ry Cooder has also taken credit for inspiring the electric riff as well. The original British single was released the day after Brian Jones death on the fourth of July, 1969, and copies of the record were given away free to those who stayed to clean the park up after the tribute concert they gave in Hyde Park in Jones’ memory. The song has been covered by the likes of Ike & Tina Turner, Waylon Jennings, Joe Cocker, Gram Parsons, Travis Tritt, Elton John, Billy Joel, Taj Mahal, Leslie West, The Meters, The Pogues, Tesla and Def Leppard. On the flip lies the epic “You Can’t Always Get What You Want,” another stone cold classic from Let It Bleed that broke boundaries of what an AM hit record could be. The album version of the song clocked in at seven and a half minutes and featured vocals on the intro and the long fade by the London Bach Choir. The single version which clocks in at a still-long-for-radio five minutes, eschews the choir intro. The song did not chart when it was first released, however it ultimately reached #42 on the charts in 1973 and remains one of their most popular songs in concert. Once Let It Bleed was released, The London Bach Choir unsuccessfully tried to have their name removed from the credits because of the album’s title and the inclusion of the song “Midnight Rambler” which was about a serial killer. The group had a hard time recording “You Can’t Always Get What You Want” because Charlie Watts could not get catch the groove of the song. As a result, producer Jimmy Miller handles the drum duties on this track. 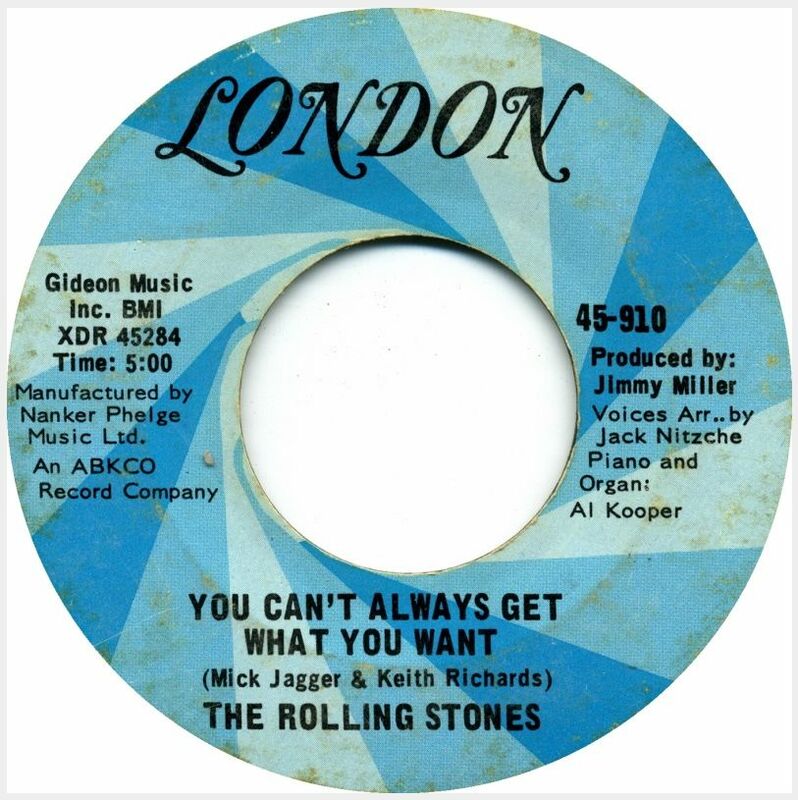 Mick Jagger: “‘You Can’t Always Get What You Want’ was something I just played on the acoustic guitar—one of those bedroom songs. It proved to be quite difficult to record because Charlie couldn’t play the groove and so Jimmy Miller had to play the drums. I’d also had this idea of having a choir, probably a gospel choir, on the track, but there wasn’t one around at that point. Jack Nitzsche, or somebody, said that we could get the London Bach Choir and we said, ‘That will be a laugh.” (Loewenstein, Dora; Dodd, Philip (2003). According to the Rolling Stones. San Francisco: Chronicle Books via Wikipedia) The lineup on the song also featured Al Kooper, who played the organ and the French horn part. This is another Rolling Stones classic that has seen its share of cover version by the likes of Bette Midler, Aretha Franklin, George Michael, Def Leppard, Luther Allison, Rusted Root, Steel Pulse, the cast of Glee and numerous others. “The Jukebox Series” focuses on the 80 records that inhabit my 1963 Seeburg LPC1 jukebox. I’ve had my jukebox (or as I like to call it “the prehistoric iPod”) for a little over 14 years and in that time I’d like to think that I’ve perfected the mix of 45s within. And no jukebox is complete without a single by The Rolling Stones! “The Jukebox Series” focuses on the 80 records that inhabit my 1963 Seeburg LPC1 jukebox. I’ve had my jukebox (or as I like to call it “the prehistoric iPod”) for a little over twelve years and in that time I’d like to think that I’ve perfected the mix of 45s within. And no jukebox is complete without a single by The Rolling Stones! The first thing that grabs you is the cowbell, and if that doesn’t get your immediate attention, then you’re dead. Then comes Charlie Watts’ rim-shot snare attack that sets up one of the funkiest drum patterns this side of Memphis. Enter the hip-swaying guitar crunch of Keith Richards and Bill Wyman’s funk-infused bass playing that sets this track (and you the listener) into motion. The rest of the band kicks into the groove…yes, on this one, it’s all about the groove. And the groove of “Honky Tonk Woman” is as infectious as it is incessant.